The Dickson Foundation Community Garden, located behind the Lowery Fitness Center, offers several volunteer and educational opportunities to the Meredith College community. The garden is open to the Meredith community – faculty, staff, and students – and hosts weekly volunteer hours on Fridays from 9 a.m. to 12 p.m. between March and October. Any member of the community may assist with weeding, planting, harvesting, and other general maintenance activities. Community members are also invited to harvest produce for their own use. William Landis, head of the Department of Nutrition, Health, and Human Performance, established the garden with the help of Aaron Schettler, Meredith College’s Director of Grounds, for both practical and educational purposes. Outside of education, the garden also serves the greater Meredith community through a number of services. In addition to hosting volunteer hours, the garden operates a produce delivery program called Meredith Supported Agriculture (MSA), where employees can request specific produce. Baskets are assembled in the garden weekly and delivered across campus. Volunteers are welcome to assist with MSA in addition to partaking in weekly volunteer hours. 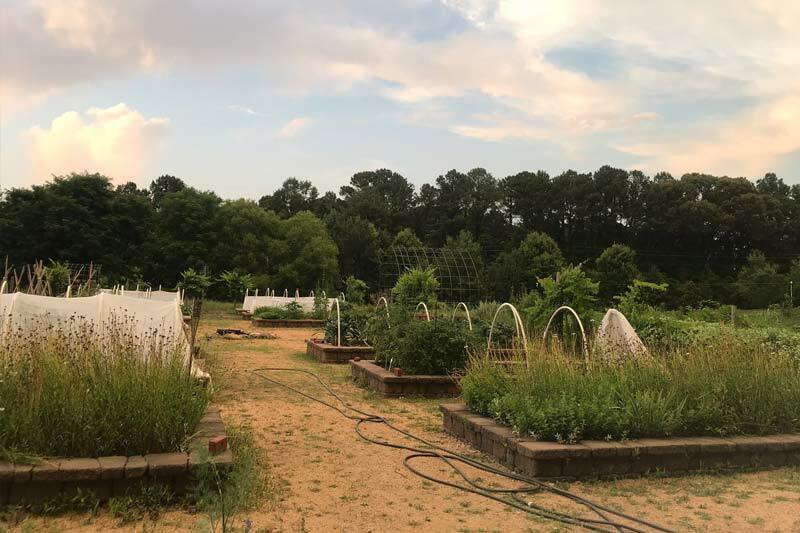 The garden also donates produce to the Meredith Kitchens program, which creates meals for underserved groups, and plans are underway to donate fresh produce to Meredith College’s Daisy Trade, which is the campus food bank in association with the Office of the Chaplain. For those unfamiliar with agriculture, volunteering with the garden can be an opportunity to experience firsthand some of the processes that bring food to the table, as well as to learn practical skills. Jackie Law, administrative assistant at Meredith’s Carlyle Campbell Library, has been volunteering in the garden on campus since 2008, and said she feels she has benefited greatly from doing so. With the move and expansion of the community garden in 2013, she found increased opportunities to learn through hands-on participation. “I began eating a much wider variety of fruits, vegetables, and herbs. Not only has my health improved as a result of being outside more, and eating better, but I’ve also strengthened my connection with the Meredith community. I am also learning from Aaron Schettler about how these plants, sunshine, and the earth provide the energy needed for my active life,” Law said. Law enjoys giving tours and encouraging others to experience the diversity and beauty of the wide variety of plants all over campus, including the Dickson Foundation Community Garden. She also manages the Meredith College Gardens Facebook page, and contributes to the Student Health blog posts. Several financial gifts have been made to the garden, and plans are in place to expand and enhance the garden, including an outdoor educational facility for interactive cooking and demonstration area. Improvements to the garden will allow for the development of a wide variety of education programs including sustainability and food and nutrition programs. Anyone interested in becoming involved with the Dickson Foundation Community Garden can contact Dr. Bill Landis (landisb@meredith.edu), Aaron Schettler (aaron@meredith.edu), or Jackie Law (jblaw@meredith.edu). Upcoming events and opportunities with the garden are posted on Instagram @dicksonfoundationgarden, and on the Meredith College Gardens Facebook page.